Referred to in sports as the “Granddaddy of Them All” because of its prestige and tradition, the Rose Bowl stadium is most famously known for hosting the annual Rose Bowl game on New Year’s Day. However, this iconic stadium in Pasadena, CA has been the home of the UCLA Bruins since 1982. In the late 1800s, the City of Pasadena begin their search for land to build a stadium. In 1897, a parcel of land was bought and two decades later, the Tournament of Roses Association decided it was time to build a stadium. Before the construction of the Rose Bowl, the annual Rose Bowl game was played at Tournament Park, where temporary stands were constructed each year for the game. Construction on the stadium began in the early 1920s and was complete in 1922. Built just for football, the first game played at the Rose Bowl was on October 28, 1922 when Cal beat USC. The Rose Bowl originally had a seating capacity of 57,000 in a horseshoe configuration. On January 1, 1923, the first Rose Bowl Game was played when USC beat Penn State. The first of several expansions to the Rose Bowl began in 1929, when the stadium was enclosed on the south end, increasing the capacity to 76,000. Three years later, the capacity increased again to 86,000 and to just over 100,000 in 1949. In 1982, the UCLA Bruins made their debut at the Rose Bowl, moving from the Los Angeles Coliseum. Since then, it has remained the Bruins home and the site of many other events. In the past decade, the Rose Bowl has underwent several improvements including new lights, a new three story press box and a video/scoreboard. In 1998, individual chairs replaced the bleachers between the endzones. In October 2010, the Pasadena City Council approved plans for a $140 million renovation of the Rose Bowl. This project includes a new 30 x 77 foot video/scoreboard, expansion of the seven level Terry Donahue Pavilion, renovation of the famed entrance, updating the concourses and restrooms, and the removal of a section of seating near the field to all the addition of hedges on the west sideline. Today the Rose Bowl has a seating capacity of between 92,000 to 94,000. The main one tier grandstand encloses the entire playing field. In addition to hosting numerous college football games over the years, the Rose Bowl has been home of the Super Bowl and the World Cup. 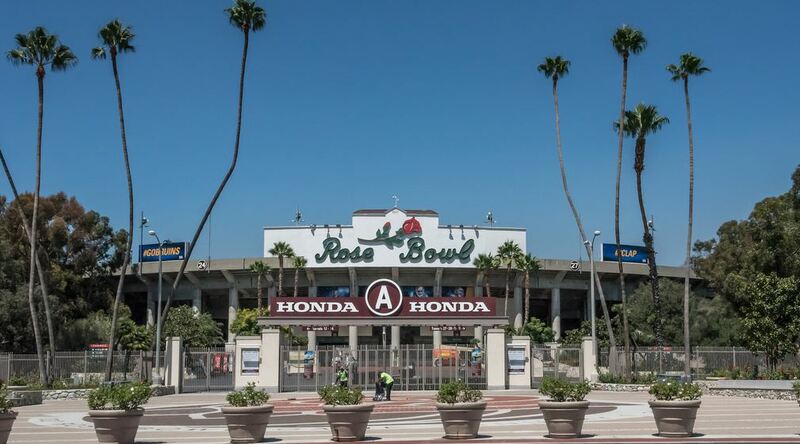 Of course it is most famous for hosting the Rose Bowl each year on New Years Day.